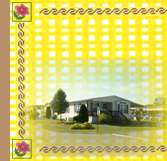 Questions frequently asked about Pin Oak - our Dillsburg, PA manufactured home community. Are there any available homesites? Please contact the office by e-mail or phone to get a listing of available homesites in the community. Two (2) pets per home are allowed, only one of which may be a dog. Our community is breed specific; please contact community manager for more information. No additional charges for pets. An appointment with the manager is necessary in order to review the community policies and guidelines. An application may be completed at that time. A copy of your drivers license and income verification is required (paystub, social security statement, etc.). There is a $35.00 application fee. What criteria do you use in making the decision to accept or deny an application? Information on the application is reviewed along with a credit report, criminal background report and past history. Decisions are normally obtained within 48 hours. We have several mailbox areas throughout the community. Where can I find a copy of Pennsylvania Act 261-Mobile Home Park Rights Act?